I am not very good with writing this blog but hope to be more prolific from now on. I have thought about why I was not blogging and it not because I wasn't sewing or that I didn't have time. I have decided that it was because I am actually shy. Awwww. This came as a shock to me as I'm normally considered to be a very confident person. But seriously the idea of posting photos of myself online is quite daunting and this has been stopping me from posting the items I have made. This blog was supposed to be a way of recording my sewing journey and all the things I have made. A gallery/diary of my progress and something I should be proud of. So I will be adding photos soon but for the meanwhile on my very new and beautiful Lady Valet until I'm feeling more confident. When I decided to start sewing my own clothes it was because, like many others, I wanted clothes that fit. My aim was to sew 12 garments in 12 months. 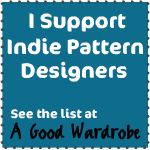 I also wanted to only use independent pattern designers. The list I started with in January has changed as new patterns have been added that I simply wanted to try. Let me know what you think and if you know which pattern number 10 is.